The tetanus diphtheria titer measures the Td antibody blood levels to check for evidence of immunity tetanus and diphtheria. What is a tetanus & diphtheria titer? A tetanus & diphtheria titer measures Td blood antibody (IgG) levels. Why is a Td blood test important? The Td blood test checks for tetanus & diphtheria immunity in the blood. This Tetanus Diphtheria Titer is a blood test. The Td titer, also known as a tetanus and diphtheria titer and Td blood test, measures Td IgG antibody blood levels. The Td titer test builds on the tetanus titer by testing the diphtheria titer. Diphtheria is a type of infection caused by the bacteria Corynebacterium diphtheriae which is spread by contact with secretions from an infected person. Diphtheria infections are more common around the world than in the United States, largely because diphtheria is included in the routine vaccine series given to children and adults. Diphtheria causes fever and throat discomfort which can progress to more severe symptoms. The Td blood test is often ordered by students and healthcare workers who need to prove immunity to tetanus and diphtheria. To get a Td titer near you, order online and get your blood drawn at the selected Quest Diagnostics lab. 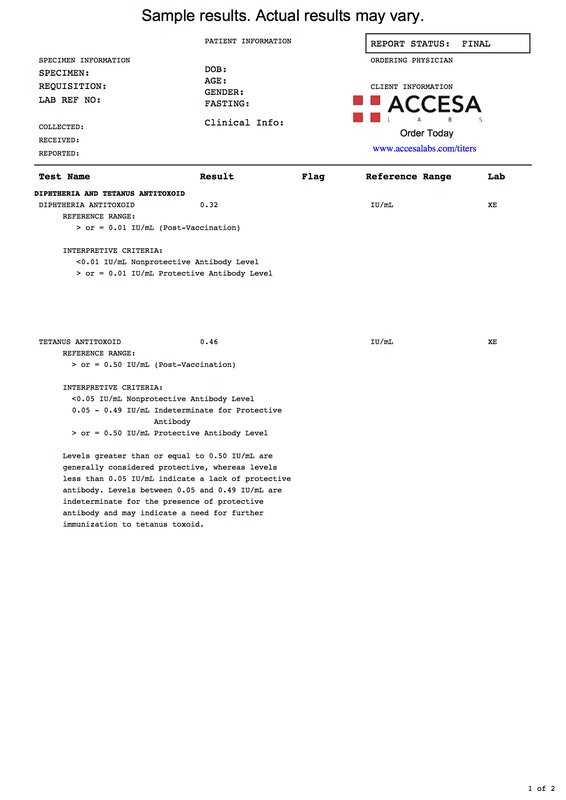 Once your diphtheria lab report is ready, it will be available for download. As can be seen on the sample Td lab results, Td antibody blood levels are reported as quantitative results and can be compared against the reference ranges provided by the lab. A positive tetanus diphtheria titer typically means that one is consider immune to Td. If you are also interested in testing your pertussis titer levels, please see the Tdap titer. Travelers getting the Td lab test for immunity may want to consider getting the polio titer and the hepatitis A test. Tetanus Diphtheria Titer at Guaranteed Prices.